The Los Angeles Times puts on an amazing food festival every Labor Day weekend filled with copious amounts of food and free flowing alcohol that is not to be missed. It's always one of my favorite events of the year where you get to meet big-named chefs, your favorite food bloggers/writers, and food personalities. There are great panels and demonstrations and most importantly, great food! The Taste is comprised of 5 events. I ended up attending 4/5. Not bad, right? Trust me, it was no easy feat! I was on hand taking pictures and writing for LAist and LA Weekly, but here, I'll be breaking down my favorite dishes of each event. 9/3, FIELD TO FORK RECAP: Japan was out in full force for The Taste this year. 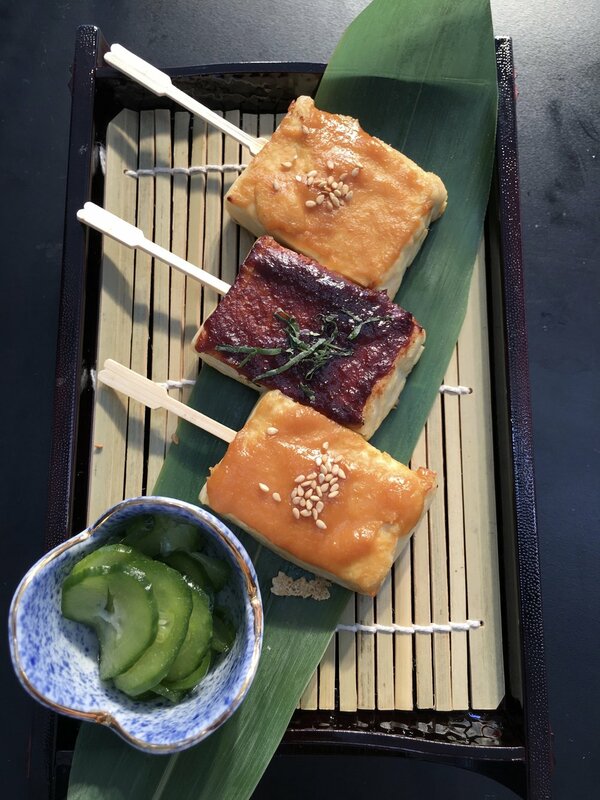 The Japanese Tourism Board has really been upping their game especially with so many Japanese restaurants opening in Los Angeles, but also because of the upcoming Olympic Games! They even brought out a really kawaii ramen Snapchat filter! I participated in the cooking demo by Chef Katsuya Uechi, Yes, that Katsuya! In addition to Chef Katusya's demo, there was also a Chardonnays of the World presentation. Other favorites include a cooking demo featuring Michael Cimarusti (Providence/Connie & Ted's) and one featuring Chef Esdras Ochoa (Salazar). Jeni's Splendid Ice Creams out of Columbus, Ohio, was hands down my favorite dessert of the Field to Fork event. They are known for their hand-scooped butterfat-rich ice creams. I had a scoop of their Gooey Buttenrcake Sundae and I cab say that I am a new fan! Keep in mind everything is tasting size so not every dish is photogenic per say, but that's actually a good thing considering how many booths you have to go through! Left: Mexicali's Vampiro Asada-a grilled steak quesadilla with their signature garlic aioli. The flour tortilla was crispy and perfectly bite sized. As usual, Mexicali's meat was flavorful and packed a punch! 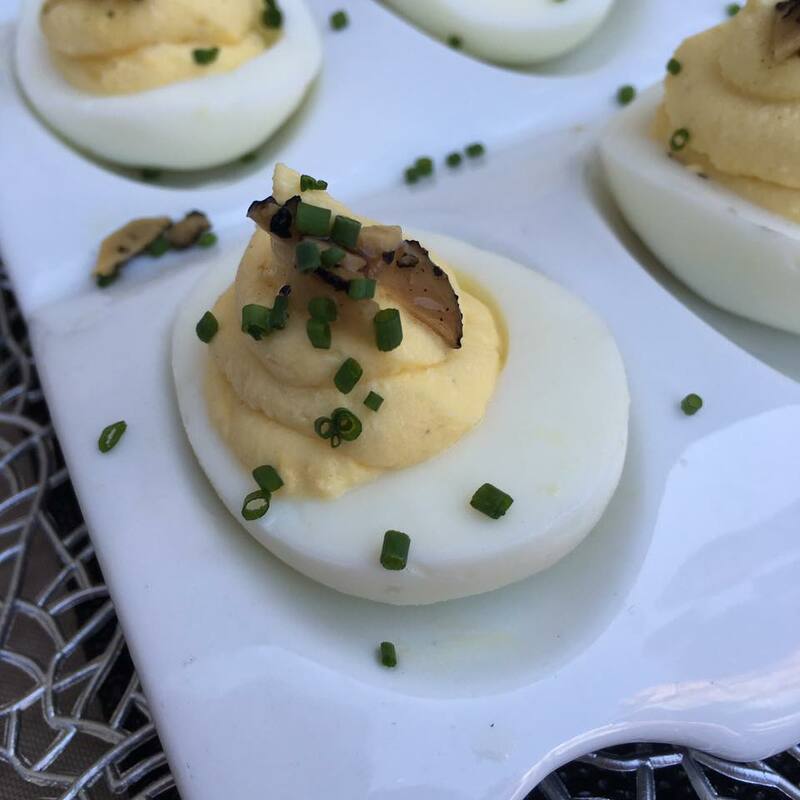 Center: Ocean Prime's White Truffle Deviled Eggs were a egg lover's dream come true. The truffle was powerful, but now overbearing! I could have eaten them all day. Right: Manhattan House's Sourdough Burrata with Sun Gold Tomato. The bread tasted so fresh and that was because the bread is made fresh daily. Beautiful presentation. Who doesn't love something sweet for brunch, right? LA Chapter, which is a restaurant located in the famed Ace Hotel brought these fluffy Ricotta Pancakes to the party! It was topped with a delicious Honeycomb Butter and maple syrup. My No.1 favorite savory dish from Field to Fork event was hands-down M Cafe's coconut yellow curry with miracle noodles! They are gluten free, vegan, and taste delicious! The dish has tofu, cashew, carrots, bok choy, fried onion, micro basil, konjac flour, coconut milk, garlic, lemongrass, Thai ginger, sunflower oil, and maple sugar in it. Miracle Noodles are low carb, low calorie, carb free Shirataki noodles, and M Cafe took it to the next level. I had 3 of these! The Springs brought 2 tasty dishes to The Taste: Vegan Ceviche with lychee, kombu, chilies, citrus and Kale Salad with coconut bacon, Sun Gold Tomatoes, Ninja Radish. Both dishes are vegan. I reported on The Springs all-plant based menu for LAist here. Both dishes were refreshing and healthy! During the demo by Chef Katsuya, he made 3 miso based dishes: A miso eggplant, miso tofu, and miso salmon dish. I even got to hang out for a bit with Chef Katsuya after his panel. One of my favorite drinks of the Field to Fork event was Ocean Vodka's Shiso Berry Fresh. Ocean Vodka is an all organic vodka that is made on the beautiful island of Maui. Kye's vegan brownie was also a nice goodie to take home. It tasted just like a regular brownie! The theme of the day seemed to be on the healthier side. There was so much food and drink that I was rolling on the floor. Of course, this is just a taste of what was available at The Taste. Ha! See what I did there? I took a break for a couple of hours and proceeded to go back to the Paramount Studios lot for Round 2: Dinner with a Twist event. Stay tuned for the recap! I had a great time meeting up with some of my favorite food bloggers and tackling the event together! To see all the chefs, hosts, and restaurants that participated in the event, check out their event page here. Stay tuned for part 2. Sep 3 Celebrate Sangria Week!